The remains of Fort Barton stand on a rise 110 feet above sea level that is capped by an observation tower offering a commanding view of Narragansett Bay. During the early years of the American Revolution, the fort occupied a strategic highpoint overlooking a bottleneck of navigable water between the Sakonnet River and Mount Hope Bay, the shortest distance between Aquidneck Island and the mainland. These narrows—connected by a series of ferries and bridges from the 1680s—were the most vulnerable part of the passage for vessels plying the waters between the upper Narragansett Bay area and the Sakonnet River to Newport and the open ocean. After the British occupied Newport and Aquidneck Island in 1776, Tiverton became an asylum for American sympathizers and a mustering point for Colonial forces. Construction of the fortification was a joint effort by the governments of Rhode Island and Massachusetts. On June 11, 1777, British officer Frederick Mackenzie described these efforts in his journal: “The Rebels have been busily employed in making a work on the hill above Howland's ferry where their guns have been placed all the Winter. It appears to be very extensive, and must cost them a great deal of labour, as there is little or no soil on the hill.” On June 28, 1777, the Americans erected a flagstaff at the fort and raised their colors. The following day, Mackenzie described the fort as "irregular in its figure, but very extensive. From the situation, it must be strong." A week after the fort was commissioned, Lieutenant Colonel William Barton led a daring raid to capture British General Richard Prescott on Aquidneck Island. This exploit brought such renown that the fort at Tiverton Heights was named Fort Barton in his honor. 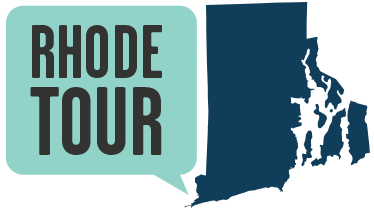 During 1777 and 1778, thousands of Colonial troops—including Paul Revere and John Hancock—were assembled in Tiverton for an invasion of Aquidneck Island. During the summer of 1778, 11,000 Continental troops and militia ferried across the narrows in one of the greatest massings of American soldiers during the war. With French naval support crippled by a storm, American troops fought their way back to Tiverton under the protection of the guns at Fort Barton. After this battle, most of the soldiers departed the area, leaving only a handful of men at the fort. In 1923, Dr. Roderick Terry donated the site to the Newport Historical Society. During World War II, Tiverton Civil Defense erected a plane-spotting tower atop Fort Barton, and a continuous watch was maintained. A current Tiverton resident remembers her father volunteering four-hour shifts to spot enemy planes, whose silhouettes were painted above the tower’s windows. In 1968, the property was transferred to the town of Tiverton. Today, a park includes remains of the earthworks, an observation tower, and a nature walk through the woods to the east along Sin and Flesh Brook. View of the Sakonnet Passage from Fort Barton: This photograph taken from Fort Barton shows the narrowest portion of the passage between Tiverton and Portsmouth, connected by the Stone Bridge. This photograph was taken after 1898 when the bridge was reinforced with steel to safely carry trolleys on and off Aquidneck Island. 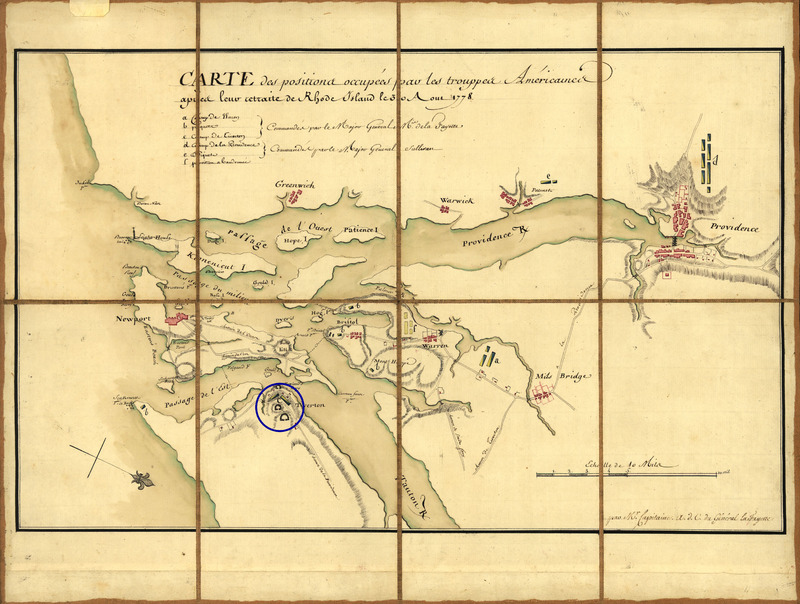 Map of Narragansett Bay, 1778: A French cartographer created this map of Narragansett Bay and American military positions in 1778. Fort Barton is identified in this digital image by a blue circle. D. K. Abbass, Ph.D., “Fort Barton, Tiverton,” Rhode Tour, accessed April 21, 2019, http://rhodetour.org/items/show/52. D. K Abbass, Revolutionary War Forts in Rhode Island Public Parks, RIMAP Heritage Trail Guide #1, (Newport: Rhode Island Marine Archaeology Project, 2010). D. K Abbass, Rhode Island in the Revolution: Big Happenings in the Smallest Colony, Part III: The Land Sites, Second Edition, Report for the National Park Service Battlefield Protection Program (Newport: Rhode Island Marine Archaeology Project, 2006), pp. 663-664.